Get in touch with nature at this charming creek-front retreat. Here's a fact that you probably know all too well: stress is a part of daily life. This is especially true when you consider the hectic, fast-paced times that we live in. Between work, kids, commutes, and congestion, odds are you're hit with a slew of stressors every day, which is why you deserve to decompress and clear your mind every now and then. If it's time for you to get away from it all, we've got the perfect place for you to do so! 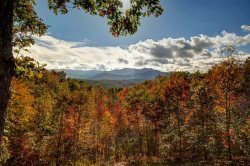 Welcome to Cold Creek Cottage; where you can leave the sensory overload of the city and suburbs behind, and discover the serenity that your brain and body need to recharge, all wrapped up in a wonderfully wooded retreat just minutes from Downtown Blue Ridge. This charming cabin is nestled on a large piece of land, amongst shady green trees and the comforting sounds of Hothouse Creek, the latter of which resides only a few feet away from the front door of Cold Creek Cottage. Step through the front door and discover the calming effects of cottage life, with a wood burning fireplace, soft sofas, a relaxing recliner and flat panel TV for your enjoyment. With screened-in deck access located just a few feet away from the couch, you can enjoy the sounds of the creek any time of the day or night that you like. Prepare breakfast, lunch or dinner in the fully equipped kitchen, which has all the comforts of home like a Keurig coffee maker, granite countertops and more. Lay down for an afternoon nap in the king size bed, just a few feet from the living room, or head upstairs to the loft area where you will discover a queen size futon, twin bed and private deck access, where you can take in the soothing sights and sounds that only Mother Nature can provide. Of course, at Cold Creek Cottage you will probably spend a good amount of time outside, where portions of Hothouse Creek stretch the length of the property; perfect for a playday with the kids or a fishing session with friends. Throw a football around for a little more fun, or go for a tranquil trot around the grounds of the cabin. Relax around the firepit and roast marshmallows in the evening, or soak away your worries in the luxurious hot tub, found on a raised platform just steps from the front deck. No matter what you choose to do at Cold Creek Cottage, peacefulness prevails around every corner. Treat yourself a healthy dose of Mother Nature - you'll be happy you did! Great experience, very easy to work with, easy to contact if needed. Great experience renting from Southern Comfort. Check-in and check-out procedures were clear and easy, the property was in excellent condition, and Southern Comfort reached out to make sure our stay was perfect and let us know they could be reached with any needs. Loved it! Hope to be back soon! Great location, very private but within easy driving distance to local stores and attractions, exceptionally clean and cozy property.